So what brought me to Surah? 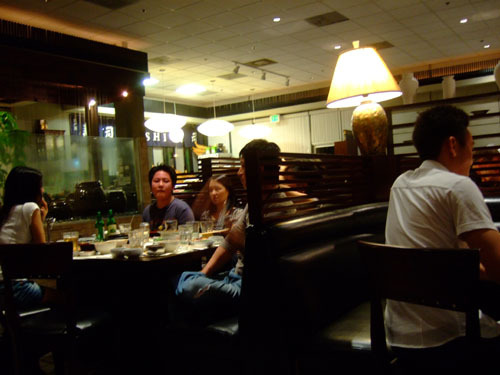 I actually came here to dine with an old friend from my high school days, who happened to live in the area. 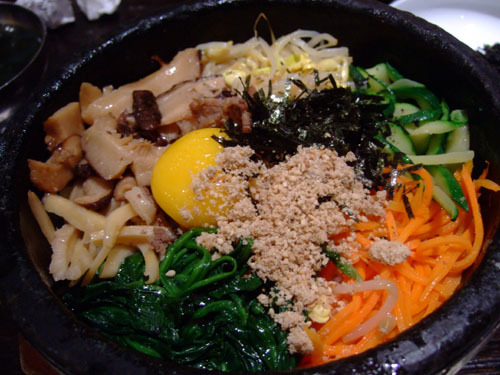 I mentioned I'd like a place with a good bibimbap, so Surah was his choice. 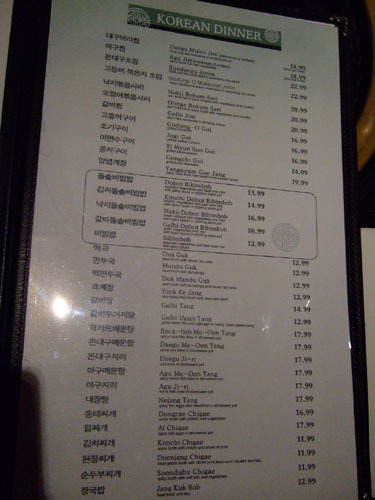 It is interesting to note that although Surah is a Korean restaurant, a large number of Japanese dishes are available. 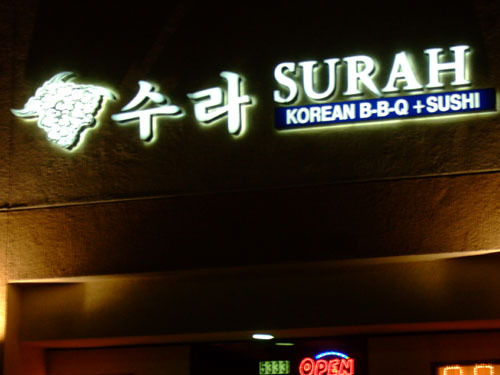 Located in a Korean strip mall, Surah's exterior is fairly pedestrian. Parking is plentiful in the mall's lot. 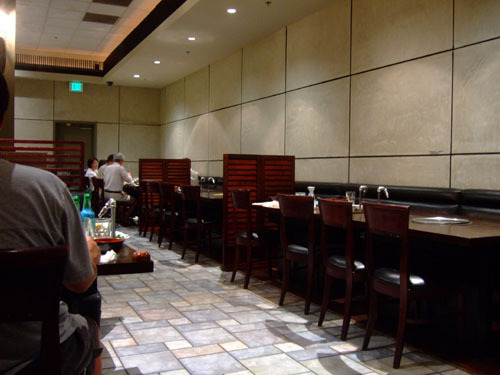 The interior is surprisingly contemporary, as it appears that the owners actually put some thought into the decor. 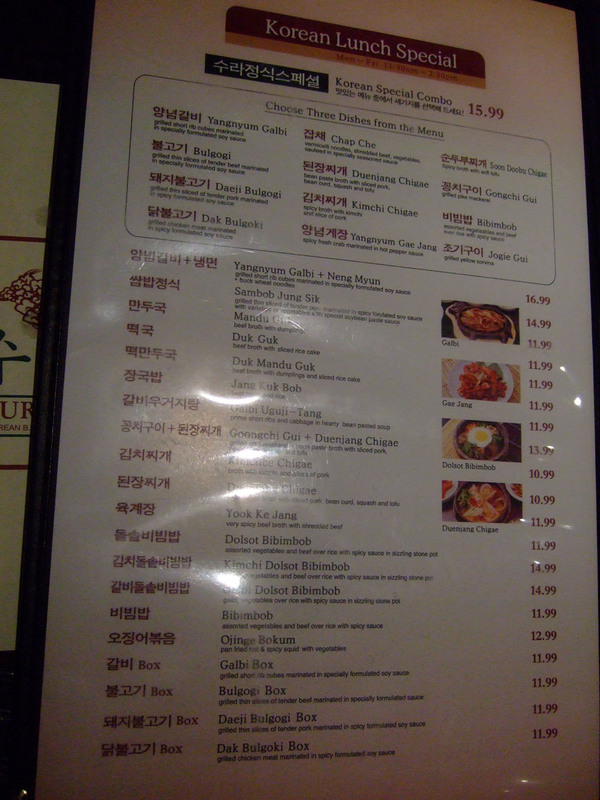 Surah is literally the nicest looking Korean restaurant I've been to. The vast menu begins with Korean and Japanese lunch specials. Click for larger versions. But we were here for dinner. With such a large selection, we had a difficult time choosing what to order (naturally, the bibimbap was a must). Prices are higher than normal, though I think this is partly justified by the nicer surroundings. Click for larger versions. 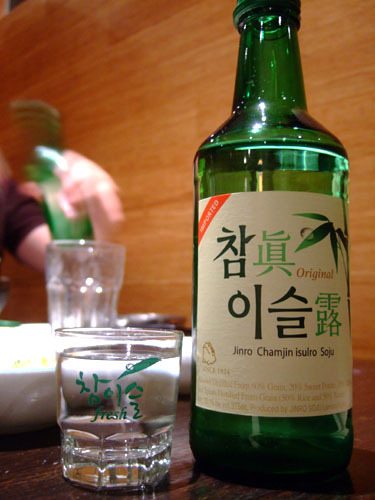 To drink, we ordered two 375mL bottles of Jinro Chamjinisulro Soju, one of the most popular mass-market sojus available. Weighing in at 20.1% alcohol, this was akin to a lower proof version of a potato vodka such as Chopin. Indeed, it's distilled from potatoes and grain (rice and barley), and filtered four times through bamboo charcoal. It had a slight sweetness, and was overall quite smooth, with only a tinge of alcoholic burn on the finish. Let's begin with a recounting of the various banchan that we were presented with. I must admit that this was the most challenging set of banchan I'd ever encountered, as many of the dishes were completely foreign to me. 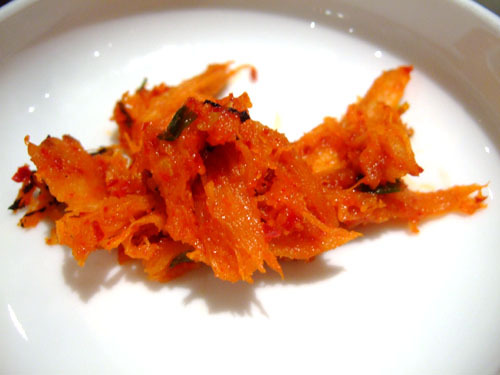 This was the root of the bonnet bellflower, made here into a kimchi-like form. It had a crunch to it, with a bit of spice as well. 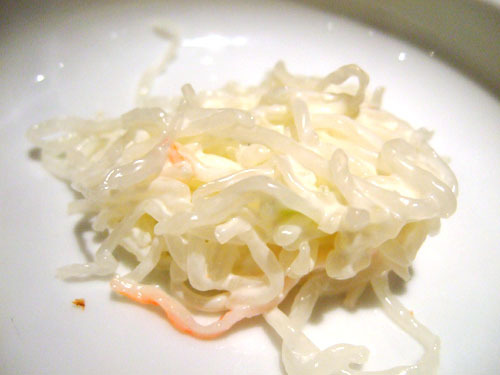 I wasn't quite sure what this was initially, but according to one of my commenters below, this was a dish of shirataki, noodles made from starch-based jelly, Japanese in origin but popular in Korea too. They showed off a definite bit of crunchiness, and came smothered in a mild, creamy sauce. 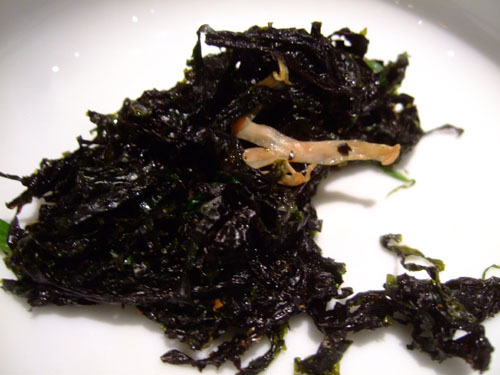 I'm not sure if this was miyeok (wakame) or gim (nori), but it did have a nice smoky flavor to it, and was quite good. 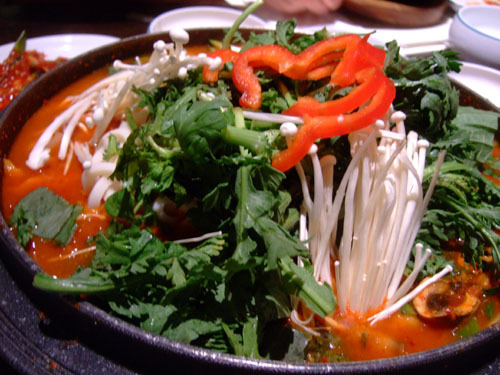 Gosari namul consists of sautéed bracken fiddlehead fern fronds, not too dissimilar to bamboo in taste and texture actually. This turned out to be one of my favorite banchan. 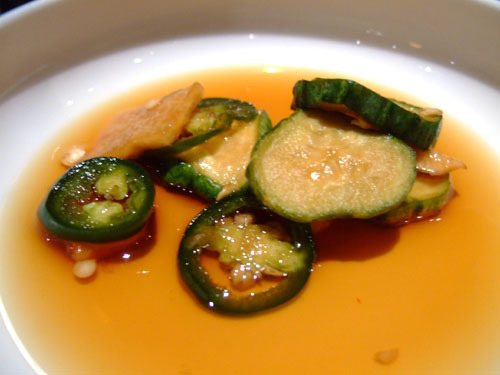 Oiji is salt-pickled Korean cucumber. The pieces had a nice bite to them, and went nicely with the relatively mild green chilies. 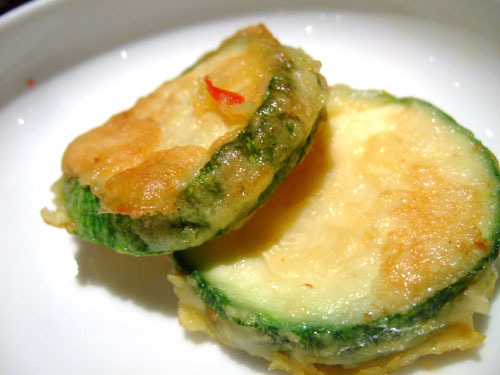 Hobakjeon means squash jeon, with jeon referring to the popular Korean batter pancake-esque banchan. The result was almost like a tempura-style preparation of the squash. Quite good. 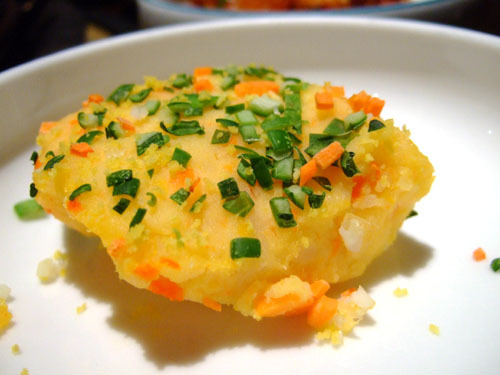 This tasted like a potato, or gamja, cake, topped with scallion and carrot. I'm not sure if this would be considered gamjajeon (potato pancake), as those are usually much thinner. In any case, it went over well with me. I believe this was a type of pickled fish, pollock I think. It had a fairly intense flavor, which unfortunately I wasn't a huge fan of. This was simply raw oysters marinated in a spicy chili sauce. 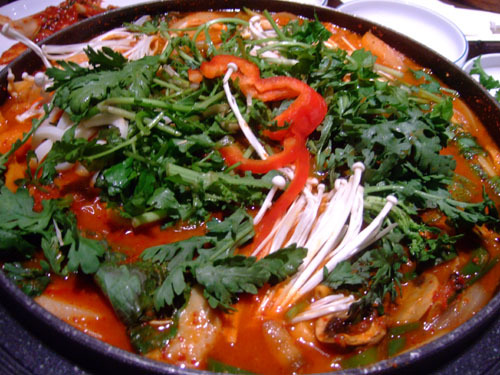 I initially mistook it for kimchi, but the dish had a slimy texture that took me by surprise. 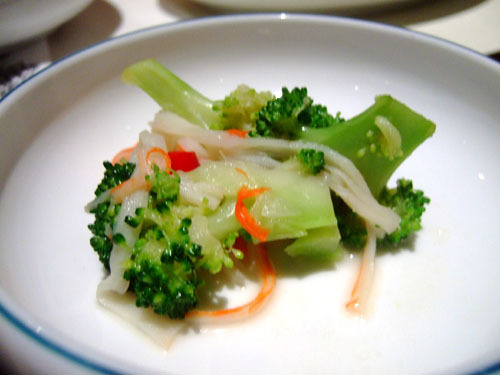 Boiled broccoli, served with strands of imitation crab. 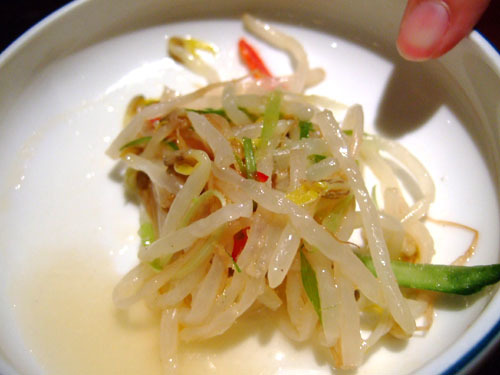 Soybean sprouts, boiled and seasoned with sesame oil. 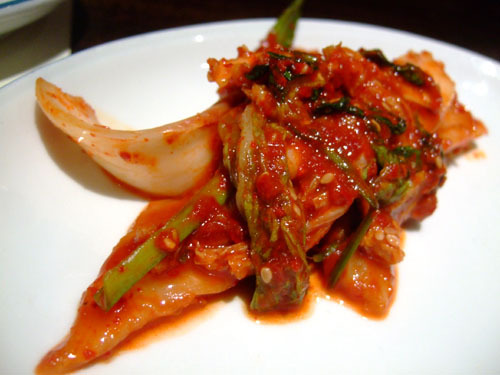 The Korean standard: kimchi made with napa cabbage. A bit spicier than usual, but still tasty. 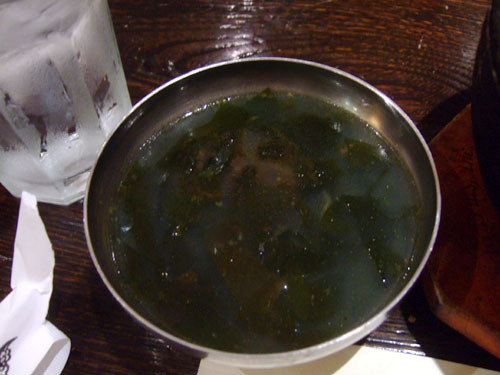 This was a soup made of wakame kelp. Apparently, it's often consumed by women who have just given birth, and traditionally on one's birthday in Korea. 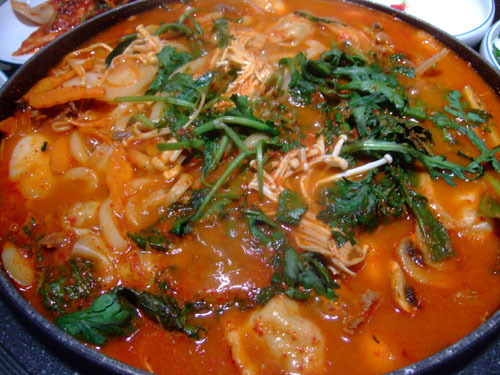 Mandu Jeongol is an elaborate Korean stew made with dumplings (mandu) in a beef broth. 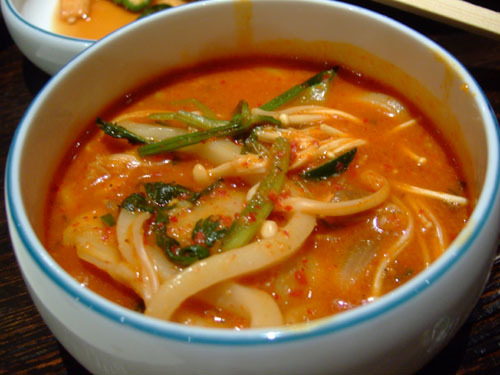 In addition to the dumplings, the stew contained enoki mushrooms, cremini mushrooms, red bell pepper, thick noodles, and rice cake (tteok), along with plenty of gochujang. The end result was delicious, albeit a bit too spicy for me. I especially enjoyed the flavor and textural contrasts provided by all the disparate ingredients, held together by the fiery broth. 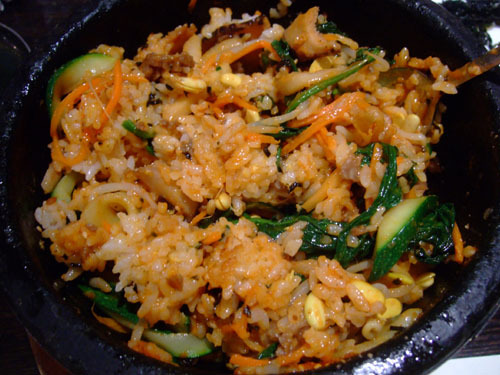 Finally, the bibimbap. 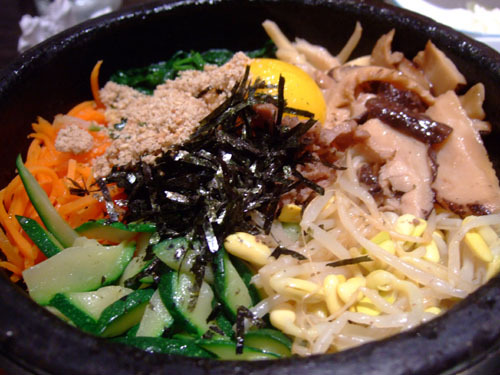 This version contained a fairly standard assortment of ingredients: beef, egg, gim (seaweed), cucumber, carrot, spinach, bamboo, mushroom, and kongnamul (soybean sprouts). 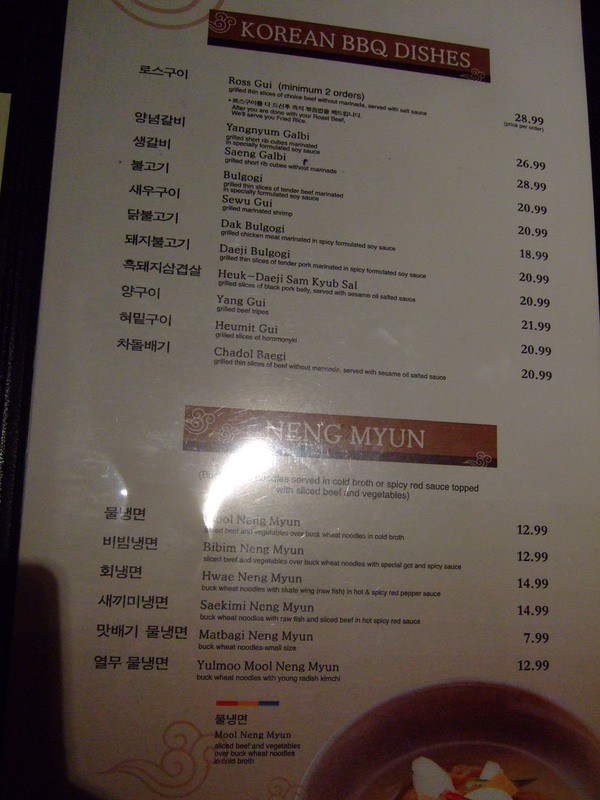 The amalgam was delicious, though not the strongest I've had (Jeon Ju and Young Dong were slightly better I thought). 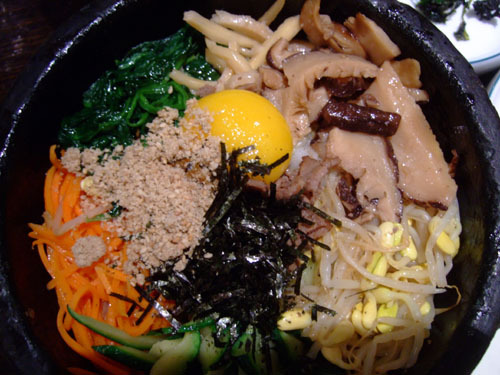 The reason was that the ingredients didn't harmonize as well as they could've, with certain items, such as the mushroom, dominating. Nevertheless, I definitely enjoyed it. I did like what I had at Surah, but I think I really need to try more dishes if I'm to give a definitive judgment of the place. From what I've read, it seems like although Surah may not be the "best" for a particular dish, as a whole, the food here is quite solid. 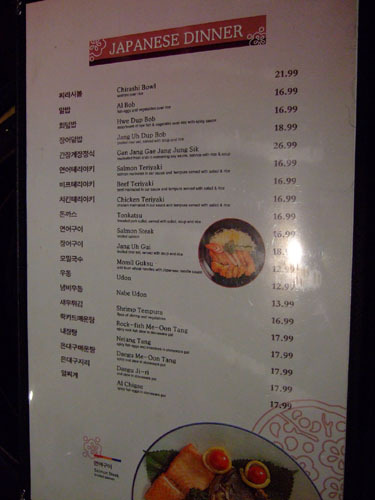 And with the vast menu, there should be plenty to satisfy just about anyone. 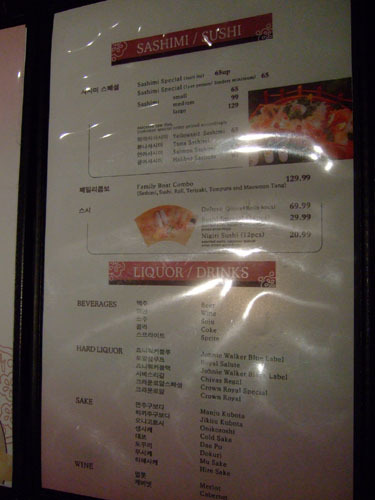 Funny you mention Woo Lae Oak though, I was just in that area at Fogo de Chao, which is right across the street. Good luck with your exams! I had one last week and have another this Thursday. Hey did you get to go to Urasawa again? How much is it per person (I dont drink alcohol)? And...am I really missing out on the tasting if I do the chefs multi course meal without wine? Im not much of a drinker (Not really tolerant) but always feel left out when I see you ordering the Mint Mojito and the expensive wine! I was just at Urasawa yesterday actually. It's $300 for food only. There's no wine pairing, but I usually get a bottle of sake and a bottle of Champagne. But given the nature of the food there, I don't think you'll be missing out too much if you just drink water. 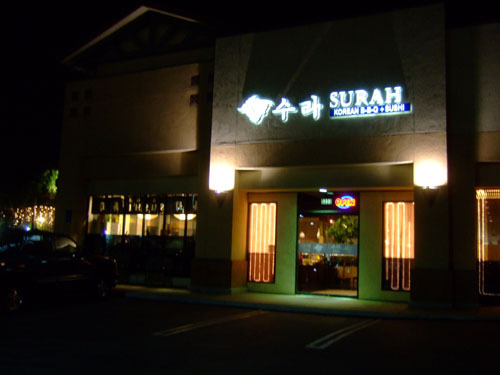 I like going to Surah for their hwedupbab (sashimi mixed rice). They also have better quality meats for the Korean BBQ for the price. 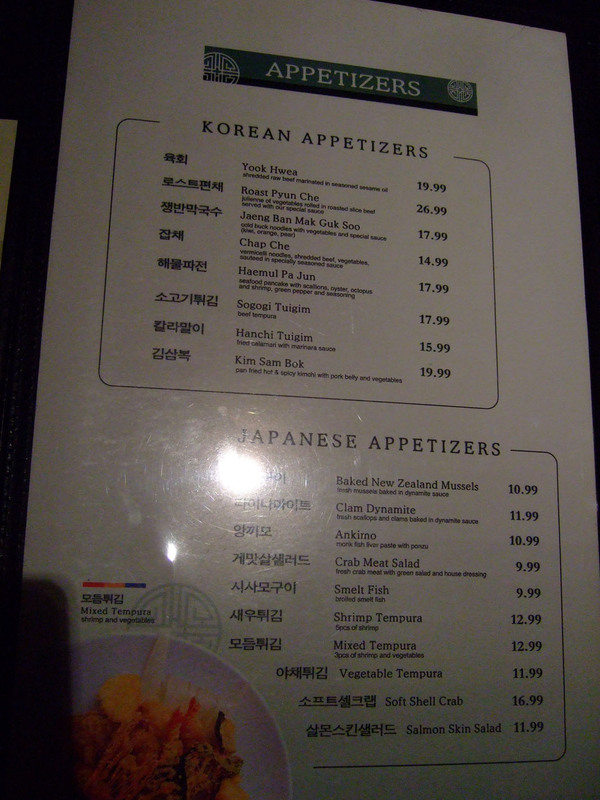 I think their prices are overall a little more expensive because of their side dishes. 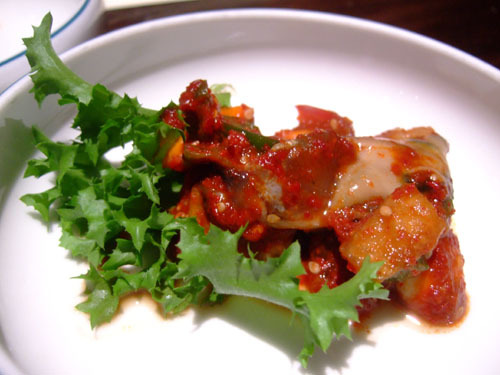 That 'gulgimchi' is actually called 'gul jut', which is simply raw oysters marinaded in a spicy chile sauce. 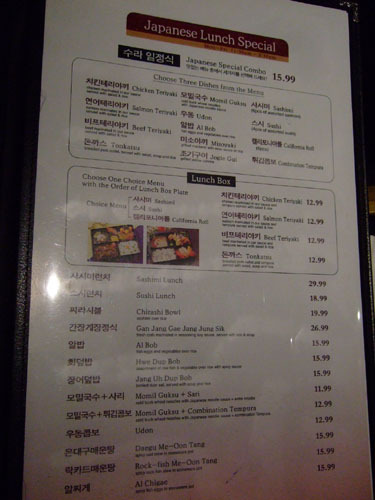 It is a fairly pricey side dish and they give you refills of all the side dishes however many times you ask for them. 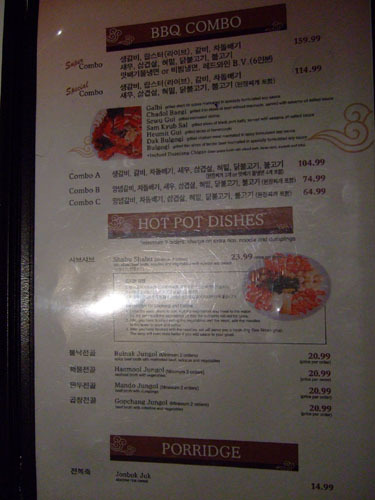 Those big dark ceramic pots you saw on display as soon as you enter the restaurant are called kimchi hangari, and they are used to store kimchi underground for fermentation. If you're ever at Surah again, walk on over to Paris Baguette which is located adjacent to the Korean market in the same plaza for some pastry, bread, and Korean cake! My favorite pastry there is this twisty stick thing with chocolate chips, and anything with chestnuts in the breads and pastry is good. The walnut cream cheese breads are good, too. Give it a try! I've made the correction to the gul jut. 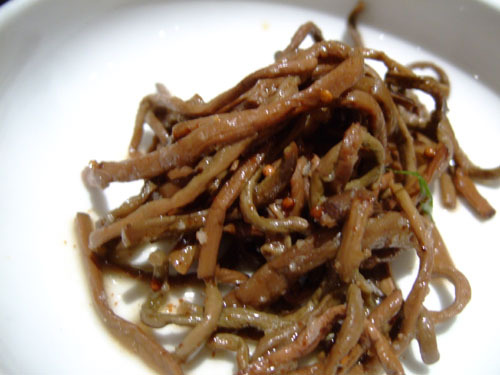 Do you know what the "noodles" were? I didn't know about those kimchi hangari either; I should've gotten a photo of them though. Hi Kevin. I've been a silent fan of your blog for a long time now. meowmixx, thanks for the tip! Can you get a name (in Korean) perhaps? 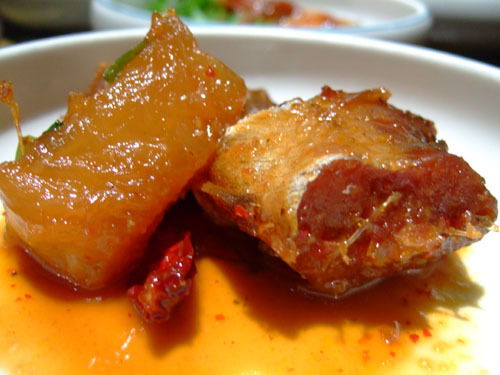 The fried korean pumpkin is called 'Ho Bak Jun (or Jeon)' which literally is Squash Jun (Jun, being the batter type banchan that Koreans eat all the time, literally). They are more like green squash in flavor than pumpkin though. This post made me laugh becuase I actually was eating these while I came across your blog!! Lol what a coincidence! Thanks for the tip; I've made the update to the blog. Incidentally, the thing you have labeled as doraji doesn't look like it to me. To my eye, its gosari aka fiddlehead ferns. They are awesome fresh, but these are the more common dried and reconstituted variety. Thanks for the help Robert! I've gone ahead and updated the post with your new info.